Bettas are known for their long, flowing fins. Years of selective breeding have produced pet shop bettas with finnage far more extravagant than their original wild form. Unfortunately, their fins can be damaged. But you can treat, and sometimes prevent, this kind of damage. Male bettas have a strong urge to fight other male bettas. Pet shop bettas, while descended from scrappy, short-finned ancestors, posses long, delicate fins. These fights can lead to shredding of bettas' fins. For this reason, two male bettas must never share an aquarium. Often the damage the fighters receive can lead to infections that kill both participants in the fight. Despite their betta-on-betta combat instincts, bettas rarely bother other fish. However, they can find themselves on the losing end of other species' aggression. Many smaller, schooling fish can pick on bettas. Tiger barbs, black widow tetras and freshwater puffer fish can all nip fins and lead to shredded fins. Some schooling fish act less aggressive when keep in sufficient numbers; they will chase and nip at each other instead of picking on bettas. Bettas themselves can damage their fins under certain circumstances. Often, bettas will bite their own fins during shipping. 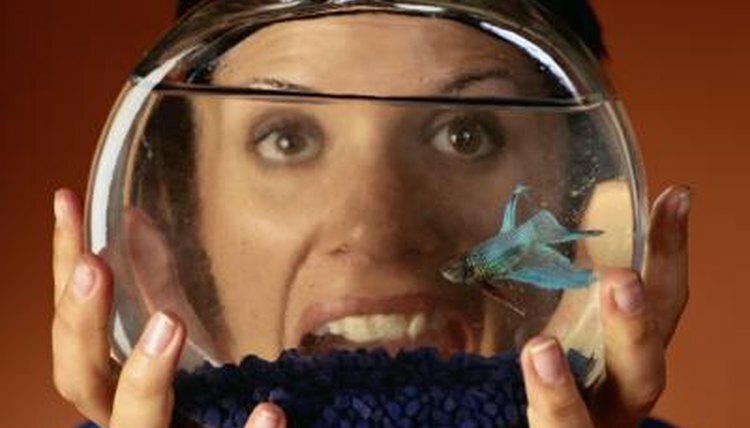 Additionally, bettas may injure themselves on sharp corners in their bowls or aquariums. Avoid any tank decorations with sharp edges. Most aquarium ornaments have smoothed edges, so this should not take any special efforts. Selective breeding has produced several variations on betta fins. One variety, the crowntail, can resemble a shredded fin. However, a crowntail's fins are supposed to look that way. The tips of the fin rays extend beyond the edge of the fins' edges. On a crowntail, the fish will always look this way; it won't suddenly happen. Often, a damaged betta fin will regenerate on its own. Keeping up on water changes and cleaning the tank will help. But sometimes opportunistic bacteria and fungi can infect damaged fins, causing fin rot. In fin rot and infections you will see a ragged edge to the fin, or fuzzy edges. Tonic salt -- rock salt or aquarium salt -- can reduce the chance of infection. If it's a more serious situation, antibiotics/antifungals like erythromycin, minocycline, trimethoprim and sulfadimidine can all treat fin rot. You can procure them at most pet shops.